BitTorrent Sync is pretty great technology. I’ve replaced most of my Dropbox usage with BTSync. Can’t wait to see how they extend it in the future for mobile. I wish the print was a little bigger. (I did notice it says something about Internet). Glad to see more of these in the wild. BitTorrent did a little write-up on their billboards here: http://blog.bittorrent.com/2013/10/08/maybe-you-saw-the-signs/ I love that they started out without the colored text at first. Unusual the billboard is on a building, instead of being supported by posts the way it normally is. I wouldn’t say it any better. I’m a fan of the software. What a bunch of great billboards, I agree wtih anip, LONG LIVE BITTORRENT! I’ve never used bit-torrent *gasps* I am not internet savvy! I think the response would be that big established “corporate brands” were also behaving unethically vis-a-vis artists, and engaged in price fixing (ticketmaster). Obviously, this does not justify illegal file sharing, but it definitely puts the Torrents in context. Reblogged this on News for Christ's Soldiers . Artists Need Options! I couldn’t agree more! This is great and interesting! I think this idea was great to put out for everyone to see, in a unique way it lets the people who are creative and hardworking know that they are being recognized. Is that in New York? Did you take the photo? I love this sign, it is all so true. I get the impression the billboards are partially public service announcements/partially ads, based on the little bit I could read from it. If whatever company erected the billboards wants the general public to know about the Internet, its advantages/disadvantages, why didn’t they make all of their words in bold print? It doesn’t seem to make any sense to me. A reblogué ceci sur Notebook pro. Yes! Yes! and Again YES!! I like the simplicity of it and the truth that it speaks in a thousand words as only a picture can paint. Great stuff. As far as Billboards/giant adverts go this is pretty empowering. And that’s how the world started to become a more beautiful place. I want more billboards like those. BitTorrent is implicitly libertarian? My opinion of those guys — whoever they are — just went UP! 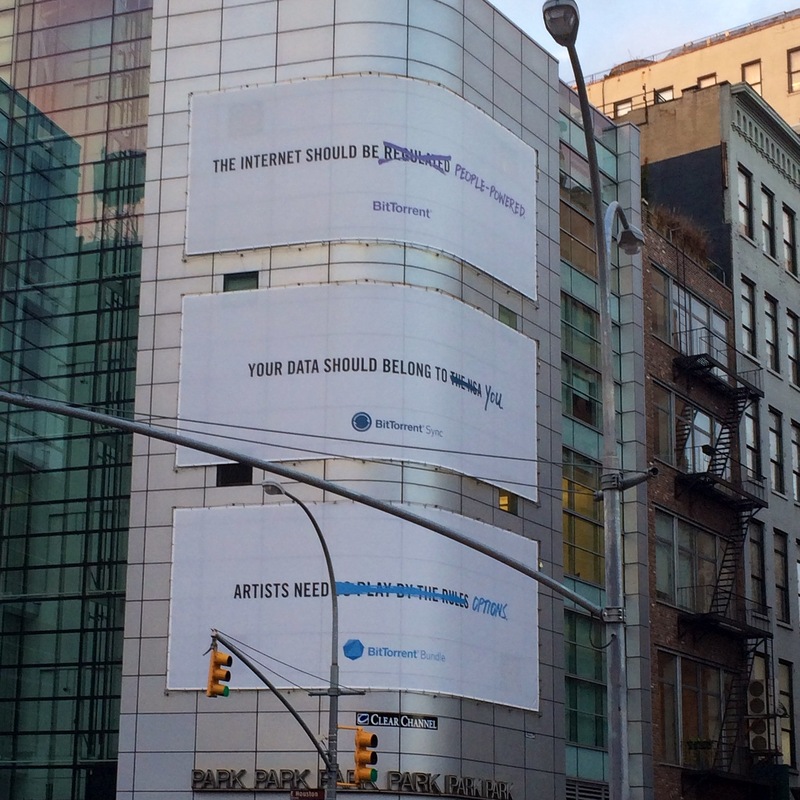 I normally don’t like seeing billboards or giant ads, but I certainly like BitTorrent & the message here for sure.